During the war many children were sent away from cities like London to live in "safer" areas. 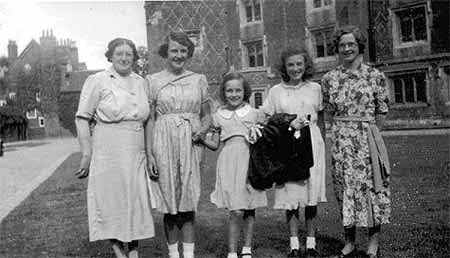 Sixty years on, one of those children now looks back at her memories of being an evacuee and the bombing of Eton College. Eva Bond (right of picture) with the 10 year old Evacuee writer of the letter at Eton College. Unfortunately, no other information is available as the correspondent’s name and address have been mislaid ... If anyone can help with this, please get in touch. Arriving at Windsor station, about thirty from the party of girls from Clapham County School were sent off to Eton College. We were then allocated to different Master’s houses. My sister aged 15 and myself, 10, were taken to Savile House, the home of Dr and Mrs Ley. As I was too young to attend the Clapham County School (who were sharing with the Windsor Boys School) I was sent to Eton Porney School in the High Street. I remember it being very much a village school – one class room with roaring fire and large fire guard, round which we dried our wet clothes! It was at the house of Dr and Mrs Ley that we were made welcome by Eva Bond, one of the two housemaids. She was very kind to two very lost and bewildered girls. By the next July my sister had finished her education and returned to London. I had passed the Buckinghamshire 11+ and was accepted to start at Clapham County School in September. Two new girls joined me at Savile House. On the night of December 4th (1940) we were sitting in the kitchen having our supper when the bomb fell. I suppose the air raid warning had gone, we were so used to gun fire we just carried on, the planes were always making for Slough. After the initial shock we tried to make our way to the back door over heavy beams and debris. Savile House being a long low house, it seemed miles away. We finally made our way to the brick shelter at the bottom of the garden which we shared with other houses in Westons Yard. We had been separated from Eva – guess she had gone in search of Dr and Mrs Ley. One of the evacuees and Mrs Ley were injured and taken to hospital, thankfully for only minor injuries. Much later that evening we were transferred to Bekynton (on the corner by Barnes Pool) where about twenty other girls from the school were housed. On the way, passing through the school yard, we just missed a large hole in the ground by the school office – little did we know it was a time bomb, it went off the next night. Eventually we managed to salvage most of our possessions but were never able to return to Savile House. I lost touch with Eva and Dr and Mrs Ley, I returned to London in July 1943 having spent my last year living at the Provost Lodge (below stairs of course)! I was put in touch with Eva again quite by chance many years later. Sitting chatting with a lady at a National Trust house, I believe in Cornwall. She told me she came from a little village near Windsor - Eton Wick. Of course I told her my connection with the village and yes, she did know Eva. I was thrilled when she offered to put us in touch with one another. My only regret is that we never met again. Although all this happened 60 years ago the events of December 4th 1940 remain very clear today. Evacuated and bombed out when my home in London remained safe! Note: in 1939 the school was evacuated from its central London location and the pupils were relocated to Windsor County Boys’ School, where they remained for the next four years, sharing classrooms and resources with the Boys’ School. In 1944 they returned to Clapham. This memory was recorded as part of the Eton Wick History Group's Recall 60 years on project to celebrate the 60th anniversary of the ending of World War 2.